ANTHONY, Alfred Webster (1865-1939) was born in Cayuga County, New York on Christmas day, 1865. He became a field naturalist and mining engineer by profession, and in 1886 he moved to San Diego, where he became one of the early directors of the San Diego Museum of Natural History. Anthony worked extensively in southern California and Lower California, collecting mammals, birds, reptiles, invertebrates, plants and minerals. He developed a particular interest in the islands off the coast of Lower California and purchased the schooner H. C. Wahlberg in order to facilitate his collecting trips. His private collection of over 10,000 birds was sold to the Carnegie Museum [CM], Pittsburgh, Pennsylvania. Several birds, including Anthony’s Green Heron (Butorides virescens anthonyi), and several mammals are named in his honor. Alfred W. Anthony visited the Sierra San Pedro Martir in May of 1893 with Wilfred W. Anthony, T. S. Brandegee, Eugene C. Thurber, and Harry E. and Charlotte M. Wilder (Ewan 1942) . Anthony visited San Clemente Island August 22-29, 1894 with E. A. Mearns as a part of the International Boundary Commission. They accessed the island via the U.S. revenue cutter, Wolcott. » Anthony, A. W. San Clemente Island, August 22-29, 1894 unpublished A. W. Anthony field catalogue. Carnegie Museum of Natural History, Pittsburgh, PA. 3 pp. 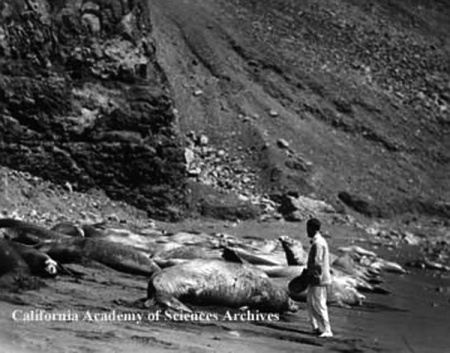 » Anthony, A. W. The Elephant Seal off Santa Cruz Island in Journal of Mammalogy 2:112-113, 1921. This page was last edited on 30 March 2019, at 19:11.